The Guidecraft Red Art Table & Chair Set has a sturdy hardwood table with a smooth, fine grain that makes it exceptionally durable and easy to clean. 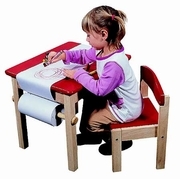 Use for coloring, painting, or drawing, can also be used without paper as a project table! Features a paper roll caddy and a child-friendly paper cutter.